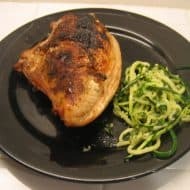 I’ve mentioned elsewhere that I started this blog to keep track of recipes that I come up with that I want to be able to make again. This curry recipe is one of those. It’s an Indian-style curry with lots of inflammation-reducing (hence, “incredible shrinking”) ingredients like turmeric, ginger and garlic. These ingredients are known to help reduce pain in those suffering from arthritis and fibromyalgia. It’s also super low in carbs and really satisfying.